The KW3 is the plug and play 220V~/380V~ independentelectric power supply solution. 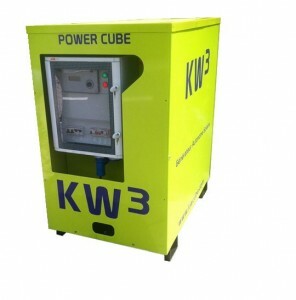 The KW3 is an independent solar generator that contains storage (gell cell technology), inverters, solar panels, connection componentry, and safety equipment. The KW3 is ventilated by an exclusive high-performance filtration system. The KW3 integrates an innovative architecture structured around a 230V~ internal network. This choice enables development of the system and enhanced performance compared to conventional systems. During the daytime, the KW3 supplies your needs as a matter of priority via energy directly produced from the solar panels, with the surplus energy being stored. Likewise, when there is not enough solar energy, the supplementary amount is provided by the array of batteries.